A long time ago, a band of wealthy individuals built a great city in the desert to show off their wealth, and lured in the greatest merchants from all over the world to come to trade in their city. Unfortunately, the wealthy men were cruel, and their gold was not valuable enough to keep a flow of merchants and consumers into the city. Soon after, the wealthy began to die slow deaths, surrounded by opulence and riches, because they couldn’t very well eat their gold. Instead of allowing themselves to die, they began to construct deadly traps and perform rituals that summoned genies to help them protect their wealth from inevitable treasure hunters. This, dear friends, is where City of Brass begins. While there has definitely been a glut as of late in the rogue-like genre of indie games, very few have come with the pedigree that brings us City of Brass. A 3D, first-person rogue-like action game that finds us in control of an unlikely pair of travelers that have come to seek out their own fortune in the fabled ghost town in the desert. Whip in one hand, scimitar in the other, senior developers of the Bioshock franchise teleport us into an ever-changing death trap with animated skeletons and deadly traps acting as gatekeepers to unimaginable wealth. I feel the need to mention the involvement of former Bioshock developers because when this is one of the first things you read in press statements and other promotional materials, it plants a seed in your head of expectations. Now, the trailers for the game mostly leave out this tidbit of information, and instead, smartly, focus on the actual gameplay aspect of what you’re getting yourself into. I’ll quickly gloss over why I even bring up these expectations- when going into a game made by team members of a previously successful franchise, there are two things that need to be considered. Is this new game similar to the previously mentioned game? If so, what are they going to do to make this new game seem distinct? If it is sold as a spiritual successor, how will they stay true to what makes those games beloved, but how are they going to innovate on those ideas to move the franchise along (even if only in spirit?). The other side of this, which we will explore here- is whether that franchise had technical achievements or innovative moments that might be expanded upon or mimicked in this new property that is unrelated to the previous. The only similarities that City of Brass shares with Bioshock is the first person perspective, and the use of a consumable item to grant magic powers. Neither of those things is really what made Bioshock a beloved franchise, and so we can now safely move on from comparing and contrasting the two properties.much to the benefit of City of Brass. However, I will bring to the table the idea that working in a familiar perspective has actually hampered City of Brass. To me, and many others, the first person perspective can be an incredibly disorienting perspective to experience a game from. Especially when you are possibly being assaulted on all sides by potential enemies, and also have to be aware of ground and wall traps that could gravely harm you. When you are moving through the levels, you will constantly be searching the ground for spike traps, and the wall for hot air traps. Couple this with looking around for enemies, potential treasure pickups, and the occasional area that must be overcome by finding an overhead hook to use your whip as a grapple on, and you can see why it is unpleasant to start taking damage from an unknown location. Whipping around the camera to find the threat and line up your whip or melee can lead to a lot of unnecessary damage or deaths that having a third person option would really help protect against. 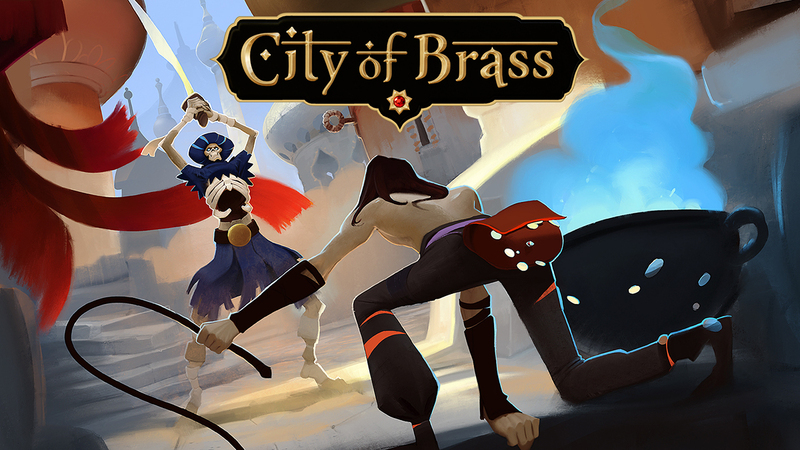 As far as the combat is concerned, however, City of Brass actually does an amazing job at making it engaging without being too difficult or repetitive. Sure, you can just try to run up to every charging monster and slash it apart with your scimitar (ZR), but, you’ll stay alive a lot longer, and have more fun, if you learn to utilize your whip and environment properly. The whip (ZL), can be used to stun enemies by whacking their heads, trip enemies so they are on the ground and easier to slash, or even grab enemies and drag them on to a trap, which will then dispatch them. You can also use the whip to knock floating enemies completely out of the park, and if an enemy gets too close you can push them back to give yourself some space. The whip can also collect treasure at a distance, and pick up items that can be thrown using the melee hand. This could be a jar, or something like a lantern to be thrown to light an enemy or area on fire. Boss fights happen every so often, and they’re fairly satisfactory. Your main goal in each level is to simply navigate your way through the level itself. You have an arrow that guides you through the city, and that makes it easy to find the way that you’re supposed to be going, but isn’t always very helpful if you try to explore and get turned around trying to figure out where you may have run across that specifically helpful genie that you saw earlier when you were broke. You see, there are genies littered throughout any given level that will sell you skills and upgraded armor, or disable all of the traps, or restore some of your health. You can also take a wish option and see the best possible items available from this specific genie, but they will be more costly, and usually way too expensive in the earlier stages of the game. So, to recap- you are trying to make your way through a city filled with deadly creatures and traps, while collecting treasure that only serves the purpose of purchasing items to make the game easier. This is a permadeath game, and health is in short supply. Too many enemies seem to take too many hits, and your health is depleted much too quickly in comparison. Potions genies seem incredibly rare, and not very helpful when you do find them since they only restore one or two hearts. City of Brass does have permadeath, and that happens far too frequently, far too soon, on your initial runs as you get a grasp on the controls, mechanics, and possible enemy types that you encounter and what traps need to be avoided. The more stages you make it through in any given run, the more experience that you gain. You need too much experience to actually gain levels, and those levels are only there to enable you to unlock more playable characters. Think it took me about 6 hours of play to unlock the first character at level 3, just for an example. When a game is designed to be difficult and includes permadeath, you have to start looking at the game design itself. If you enjoy difficulty for the sake of difficulty, you’ll be happy to find it here. If you’re like me, however, and want to actually enjoy the brutal experience, and need a reason to keep enduring the gauntlet…you will be disappointed. The reason why is simple- because none of the game mechanics makes the game an enjoyable experience. Exploration is a punishing chore. You often haphazardly wander into traps unknowingly since the level layouts are different every time, and if you are actually looking at key spots for traps, you will probably miss an otherwise obvious enemy that could have been avoided as well. However, the object impermanence also makes the drive to explore to collect treasure seem pointless- why even bother accumulating wealth to unlock a weapon or ability that you can only have access to a limited time? Doing so doesn’t seem to make it any more likely to pop up in the future over other items, and it doesn’t become cheaper every time you buy it (as some rogue-likes do to encourage you to get new items). The only reason to spend money is for health restoration (again, one or two hearts for 250+ gold pieces), or 500 gold to disable traps. Unfortunately, by the time you have 500 gold, you’ve probably already explored most of the level and triggered or avoided all of the traps anyways…and the trap disable is usually at the beginning of the level anyways, so you’d just be backtracking to do it anyway. While combat itself is satisfying because of the options available to you, getting into combat is the last thing that you want to do unless necessary because it just takes away precious health. Each level starts off with giving you a potion that you can choose to consume or ignore. Consuming it can have a helpful, or hurtful, effect. You won’t know which one it will be unless you’ve drunk it before and remember what it looks like, although there is a journal in-game that keeps track of everything you encounter and gives descriptions. You might gain temporary invincibility, you might gain the ability to freeze any enemies within a certain radius, or you might get more money for each valuable that you find or pick up. You might also poison yourself and die a slow death, or you could temporarily turn into a chicken, which renders you completely useless until it wears off. City of brass runs well, the graphics are acceptable, music and sound design is solid, and the combat is decent enough. However, the biggest flaw that can be found is that everything else about the game seems designed to discourage you from doing anything besides making it to the exit as quickly as possible. Every so often you will have to engage that boss for passage… but there’s no reason to waste time looking for loot or battling enemies. When your player’s best case scenario is lucking into a potion that makes them faster or invincible so that they can more easily run past the bulk of the game, you need to rethink what your game is trying to do.